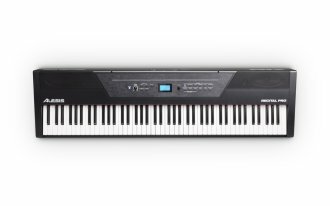 The Alesis Recital Pro has an incredibly useful feature called "Lesson Mode." This feature divides the 88 keys into two zones with the same pitch and voice. This enables both the student and teacher to easily watch each other and play together without having to take turns or reach over one another. Recital Pro also features an easy "Record Mode" that enables you to record your playing and then critically listen back to your performance. The Recital Pro features a 1/4" (6.35mm) headphone output which mutes the internal speakers for convenient, quiet private practice. In addition to a1/4" (6.35mm) sustain pedal input (pedal not included), Recital Pro also features stereo1/4" (6.35mm) outputs to connect to a recorder, mixer, amplifier or other sound system. Recital also features a USB-MIDI output for connecting to a computer and using educational software or virtual instrument plugins. Recital Pro can be powered using the included power supply or with 6 D cell batteries (not included). Skoove is the easiest way to learn piano -- featuring in-depth online piano courses that adapt to you and give you feedback. Develop your repertoire on your own time, at your own pace with a curated catalog filled with everything from current chart hits to classical music. Need a little help? Skoove's experienced team of musicians is on hand with one-on-one support to answer your questions. New, exclusive lessons are added every month so you can keep expanding your repertoire with new music as well as up your piano game with new music theory tips and tricks. Available until 11 PM (EST) today. Mention special code 205-2PV0 when you call.